And to create a new society. Knowledge is finished. Culture today consists of speaking out. 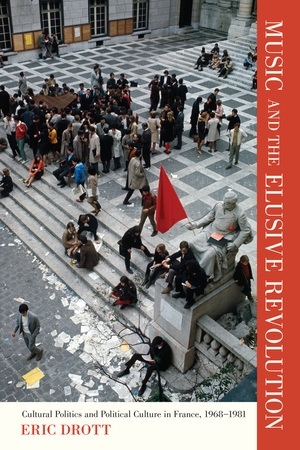 On Friday, 3 May 1968, at one o'clock in the afternoon, approximately four hundred students gathered in the courtyard of the Sorbonne in Paris. They had come to protest the closure of the Nanterre campus of the Université de Paris following a series of disturbances, as well as the threatened expulsion of Daniel Cohn-Bendit and seven other members of the Mouvement du 22 mars group for their role in stoking student unrest. The gathering in the Sorbonne followed a well-rehearsed pattern, another in the series of political rallies staged by student militants in recent months, protesting everything from American involvement in Vietnam to the government's planned restructuring of the French university system. After speeches condemning the administration's actions, the meeting drew to a close, its organizers announcing that another demonstration would take place the following Monday. The crowd began to disperse. But by 2 P.M. a few hundred students had reassembled in the courtyard, spurred by rumors that the neofascist youth group Occident was planning to confront the students as they left. With far-right students marching in the streets just outside the Sorbonne, and an assortment of anarchist, Trotskyist, and Maoist militants milling about inside its walls, the university administration feared a violent clash was imminent. Jean Roche, the rector of the Sorbonne, decided to cancel courses for the rest of the day and to call in security forces. By 4:30 P.M. the police had arrived and began forcing students off the premises, ushering them onto the rue de la Sorbonne. The students had been assured that they would be able to leave freely, but upon exiting the university, they found themselves shepherded into police vans. The actions of the police only served to inflame an already fraught situation. Incensed by the sight of their peers being led away en masse by the police for no apparent reason, students and other bystanders on the streets outside the Sorbonne grew agitated. Shouts of "free our comrades" and "the Sorbonne to the students" welled up from the crowd. Some tried to bar the way of the vans; others started to hurl loose paving stones at the police. The police responded by charging the assembled crowd and throwing canisters of teargas into their midst. By 8 P.M. the situation had exploded, as approximately two thousand students flooded the boulevard Saint Michel to protest the police's "occupation" of the Latin Quarter. The drama that unfolded over the next four weeks marked the most serious political crisis that the French Fifth Republic has faced. Within a week protests against police repression had grown in both size and intensity. On 7 May, some twenty thousand protestors marched through the streets of Paris. By 10 May, the "Night of the Barricades," the Latin Quarter had turned into a site of low-level street fighting between police and youth, with barricades erected in the streets across the fifth arrondissement. Parallels began to be drawn in the media to other flashpoints in French history, most notably 1789 and the Paris Commune. These parallels were strengthened by the exponential growth of the movement. A one-day strike called by the major trade unions swelled the ranks of protestors. One million people were alleged to have participated in the march through Paris that took place on 13 May, the day of the strike and, ironically, the tenth anniversary of de Gaulle's accession to power. But the most remarkable development came during the second week of the uprising, when wildcat strikes broke out across France. Inspired by the students' occupation of the Sorbonne (itself precipitated by the government's decision to withdraw police from the university on 13 May), workers seized control of factories throughout the country. By the beginning of the third week of May, the country's economy had come to a virtual standstill. Public transport, telephone services, gasoline and food deliveries, and other critical services functioned sporadically, if at all. Although estimates vary, around nine million people were reported to have gone on strike, making it the largest work stoppage in France's history. The sense that the country was teetering on the brink of revolution was made all the more palpable on 27 May by the refusal of the union rank and file to accept the Grenelle accords, the wage and workplace concessions that trade unions had extracted from government and industry representatives. Not only had de Gaulle's government been overtaken by events; so too had the nominal representatives of the working classes. In less than a month the field of political possibility had opened up in a way that would have been inconceivable just four weeks earlier. Doubts that de Gaulle's government would survive were widespread. And if it did fall, what would take its place? A new government, led by a coalition of left-wing parties? A new constitution and a new republic, the third in two decades? The replacement of a Republican system of government with one based on the principles of direct democracy? Or the imposition of Communist rule? That none of these outcomes came to pass has done little to rob the memory of May '68 of its force. That de Gaulle managed to hold onto power in spite of everything has only served to mythologize the May events. Unburdened by the consequences that would have ensued had the government actually toppled, the student-worker uprising of 1968 has been able to retain the magical allure of pure possibility. Yet there were other peculiarities that explain the continuing fascination that the May events exercise. Among these was the fact that such a sweeping challenge to the status quo could have materialized in conditions that, by all appearances, were hardly conducive to social unrest. France at the beginning of 1968 was, in the eyes of most observers, a peaceful and prosperous country, in the midst of an unprecedented economic expansion. Les trente glorieuses-the thirty years of growth that extended from the end of World War II to the oil shock of 1973-had promised to bring to an end the gaping disparities that had long fueled social strife in France. Increasing disposable income, the spread of credit, and an influx of consumer goods had improved the standard of living for a sizable fraction of the French populace. Politically, the country seemed to be moving past the bitter conflicts of the 1950s and early 1960s. The cold war tensions that had brought about the dismissal of the Communist ministers from the government in 1947 and that had led to the marginalization of the Parti communiste français (PCF) during the 1950s had receded. More significantly, the wounds opened by decolonization-and by the Algerian War of Independence in particular-seemed more or less healed by the late 1960s. The Battle of Algiers, the collapse of the Fourth Republic, the generals' putsch of April 1961, the massacre of Algerian nationals in October 1961, the death of antiwar demonstrators at the Charonne métro station in February 1962-such painful memories could now be forgotten. Or, if not forgotten, then at least repressed. In May 1968, France teetered on the brink of revolution as a series of student protests spiraled into the largest general strike the country has ever known. In the forty years since, May ’68 has come to occupy a singular place in the modern political imagination, not just in France but across the world. Eric Drott examines the social, political, and cultural effects of May ’68 on a wide variety of music in France, from the initial shock of 1968 through the “long” 1970s and the election of Mitterrand and the socialists in 1981. Drott’s detailed account of how diverse music communities developed in response to 1968 and his pathbreaking reflections on the nature and significance of musical genre come together to provide insights into the relationships that link music, identity, and politics. Eric Drott is Associate Professor of Music at the University of Texas. “Eric Drott’s vivid account of the impact and aftershocks of the May 1968 événements upon music and musical life in France is an essential contribution to our understanding of recent musical history. Drott explores the central role of musical genre in mediating political expression, through a sequence of brilliant studies of the chanson, free jazz, rock and avant-garde classical music. The discussion navigates deftly between evocative case study and crisply defined theoretical insight, and is illuminated throughout by a balanced appraisal of the era’s idealism and ideological fault lines. 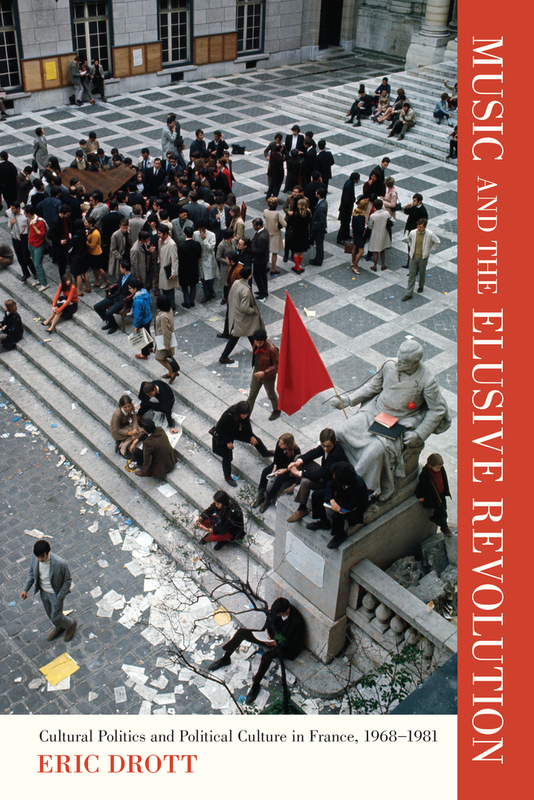 The Elusive Revolution will be mandatory reading not only for those seeking a fuller understanding of French musical life in the ‘long 1970s’, but for anyone with an interest in the relationship of music and social change."